The Island of Komodo will be closed to tourists next year, the Indonesian government has announced. But it’s not the current dilemma of “overtourism” hampering the island – it’s that too many tourists are stealing its dragons. The island will be shut down starting JAN 2020 for at least 12 months, declared a spokesperson for East Nusa Tenggara, the southernmost province of Indonesia where the UNESCO World Heritage Komodo National Park is located. It’s the only place on Earth to see these lizards in their natural habitat. The remainder of the park will remain open to visitors throughout 2020 while authorities launch a new Komodo conservation program in a bid to bolster the local dragon population. 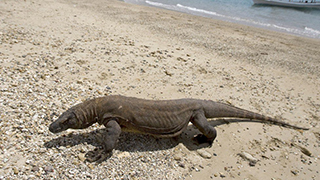 UNESCO data shows that there are currently about 5,700 Komodo dragons in the national park. Vice Media reports that the decision comes just days after East Java Police busted a smuggling ring that tried to sell 41 stolen komodo dragons on the international black market for 500 million rupiah (about CAD$47,000) apiece. In another case, Indonesian authorities arrested five smugglers on Java for allegedly trafficking komodo dragons along with bearcats, cockatoos, and cassowaries. The suspects used Facebook to make a sale. Komodos, whose blood scientists believe could aid the development of new antibiotics, are one of the most endangered species on Earth.